MULTI MASKING MODE ON! | Sheena V.
It's Sunday and I'm home with assignments nagging at me to get them done. Hence I was inspired by Tati's video to give "multi masking" a try. 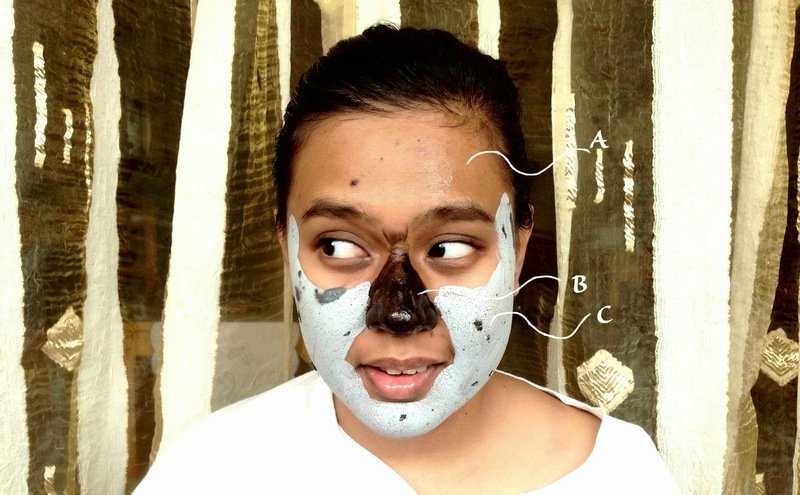 It's basically spot treating the different parts of your face by applying different masks at the respective sections. Which is great for those who need to cut time on their mask routine. Let's face (teehee) it, we don't always have time to put on more than one mask a week. As much as I want to apply my masks every 2-3 days, school and work get in the way and I forget. Or I come home late and the last thing I want to do is to put on a mask, wait 20 minutes before I can concuss on my bed. In addition, I prefer these to sheet masks because with the former, I can still go about getting tasks done. As sheet masks are usually soaked in serum, they have a tendency to slip down if you are upright. Therefore, multi masking allows for multi tasking! Without further ado, let me just quickly run through the products I slapped on my face. Multi Masking for 20 Minutes. Special Powers: This ultra gentle gel helps soothe, hydrate and detoxify dry, irritated skin. To be honest, it's my first time applying this. As I applied it on the driest part of my face, I could already tell that I prefer this over GlamGlow's Thirstymud Hydrating Treatment (the Thirstymud left my face feeling greasy). This mask has a texture similar to Aloe Vera Gel, only lighter and less tacky. No surprise because one of the main ingredients is indeed whole leaf Aloe Vera, which also explains the soothing sensation. Don't be alarmed by the green. As seen on my forehead, it's applies and dries clear. From what I can tell, the green isn't natural. At the bottom of the ingredient list is Yellow 5 (CI 19140) and Blue 1 (CI 42090). I don't understand the need but oh well. Overall, it did hydrate my forehead as lines were less noticeable. My skin was by no means irritated before hence I can't tell you how effective its soothing properties were. Special Powers: Removes dirt and impurities while gently exfoliating to reveal fresh, luminous skin. That's a tall order right there! What's unique about this is that if applied it thick enough, it can be actually peeled off when dried. Initially, I was apprehensive about having to apply a thick layer since I only have a 1 oz bottle of it (must economise mah). After a few failed tries, I took a plunge and applied an opaque layer. I didn't exactly pile it on but I did ensure that no skin was showing through. Guess what, it works! Similar to using Pore Strips, you will see tiny whiteheads on the underside. Unlike Pore Strips, this does not aggravate the skin. Much gentler, you can barely the feel extraction. To be fair, I would call my whitehead situation on my nose as moderate. So if you had greater needs, I'm not sure how would it work out for you. Maybe I should experiment it on my willing boyfriend (he actually really enjoys masks). Special Powers: Powerful, skin-clearing mud that visibly draws out dirt and congestion, leaving skin smooth and healthy-looking. For an obnoxious description, this is actually my fifth jar. Yes, I'm that crazy over this. The price tag is pretty steep on this one but I have always managed to get some form of discount (banks/membership). I have never paid full price for this product. Most of the time, this product is smeared all over my face. However, for the purpose of multi masking, I concentrated this on the porous part of my face - my cheeks. I have large pores/scars from picking at my pimples in primary school. Due to that, dirt gets collected easily. Left unmonitored, a new face demon a.k.a pimple is born. I find this mask to be particular good in maintaining the cleanliness of my pores. Now I'd like to share with you some tips that I've found particularly useful when using facial masks. Pre Facial Tip: Exfoliate before application for maximum benefit. Exfoliating allows the pores to open up, making the skin more receptive to the products. Products will only work if you let it. Using a facial wash that has micro beads is great but I make it a point to use my Clarisonic Mia 2 before I apply any facial mask. If I already have it, might as well use it right? It makes a world of a difference. In the event I've managed to fool myself into not taking that extra step, I instantly regret after because I can honestly tell that the thin layer of dead skin cells I've yet to remove is preventing my skin from soaking up the wonderful potion. Application Tip: Use a flat foundation brush for application. Using your fingers tend to result in a lot of wastage. Not all of the product would transfer from the fingers to the face. A lot ends up stuck on to your fingers. Not something you want happening, especially if the products are pricey. It's also important that the foundation brush is flat, so that it does not soak up the product. Again, it minimises wastage. Post Facial Tip: Use a toner, followed by a moisturizer when done. As mentioned, your pores are open. It's time to close them up which where the toner comes in. Depending on the toner you use, you might want to apply a thin layer of moisturizer if your toner is particularly stripping. As always, I hope this has been interesting and helpful. Or at the very least, the image of me with the masks on made you laugh. Hahaha.